Make room for the new gods of the commercial grinding world! The Eureka Olympus 75E Hi-speed has pulled out every stop to live up to its Grecian namesake. The titanic design begins with a towering footprint and a 3.5-pound bean capacity. 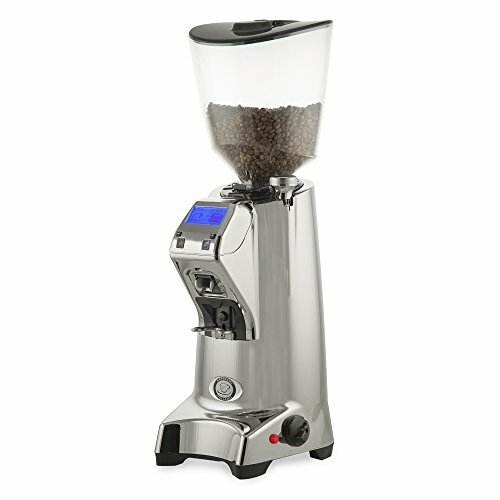 State-of-the-art 75 millimeter flat burrs in high-strength titanium pulverize beans at speeds impressive even against grinders double its price. Eureka has kept their standard one- and two-cup volumetric dosing controls and stepless adjustment dial for straightforward operation suited for the busiest cafe environments. The power-geared design is rounded out with subtle niceties like adjustable portafilter arms and an anti-static coating for easy cleanup. If you have any questions about this product by Eureka, contact us by completing and submitting the form below. If you are looking for a specif part number, please include it with your message.